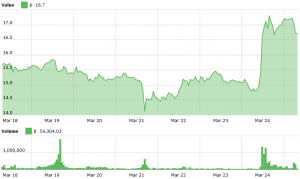 Binance coin (BNB), the native token of major crypto exchange Binance, climbed by more than 14% in the past 24 hours (UTC 05:30 AM) after the exchange announced new rules for token sale on Binance Launchpad that would increase demand for BNB. "The next Binance Launchpad token launch will be conducted as a lottery, instead of a first-come-first-served system," the exhchange announced on Sunday. 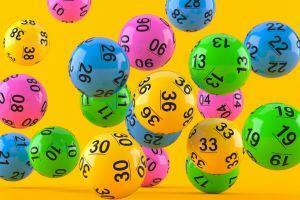 The number of tickets one can claim depends on the amount of BNB one holds over a 20-day period in a Binance account leading up to the day of the lottery, up to a maximum of 5 tickets per eligible account, it added. Also, according to the announcement, for each project, Binance will announce the maximum number of potential lottery ticket winners, and the allocation amount corresponding to each winning ticket ahead of time. Moreover, each user’s BNB balance will be recorded in a snapshot at 0:00 AM (UTC) each day. 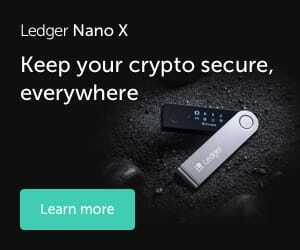 "Should a user’s BNB balance drop below the minimum balance required on any given day during the 20-day period, they will be put into the lower threshold," the exchange said. Binance has also warned about a few risks and trade-offs of this new model, such as: the daily snapshot may create some fluctuations in BNB trading before and after the snapshot time and holding BNB does not guarantee an allocation. However, Binance CEO Changpeng "CZ" Zhao said that the company will consider suggestions and "will make certain tweaks" to the new model. 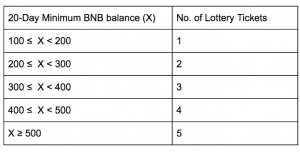 For example, some Binance users suggested to lower the minimum threshold (BNB 100, or around USD 1,660) required to enter the lottery. that seems to be the magic number a few guys suggested. Maybe we (especially I) got it wrong on the first try. We will see. The exchange promised to introduce the next token launch project within the next two weeks. As reported, Celer Network (CELR) raised around USD 4 million in less than 18 minutes during a token sale on Binance Launchpad last week. It was third token sale on the platform, following BitTorrent Token (BTT) and Fetch.AI (FET). After the initial hype, both BTT and FET decreased in value once they got listed on Binance.